The antenna will automatically be extended when the radio power switch is turned “ON” while the ignition key is either in the “ON” or “ACC” position. The antenna will automatically be retracted and stored when either the radio power switch is turned “OFF” or the ignition key is set to the “LOCK” position. 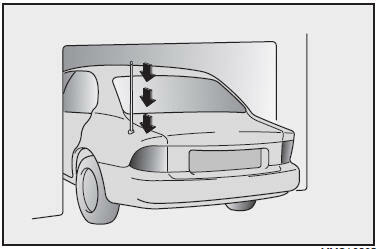 Before turning on the radio while stopped, make sure that no one is near the antenna. Before entering an automatic car wash, be sure that the antenna is retracted and stored. If the antenna is dirty, be sure to clean it before turning off the radio or the vehicle engine in order to prevent jamming the antenna.